It's hard to believe now, but Theodore Maiman's discovery was turned down from scholarly publication when he first submitted it! At the time there was a lot of work being conducted on maser (microwave amplification by stimulated emission of radiation) and the journal Physical Review Letters thought that Maiman's article was a retread of too many others. 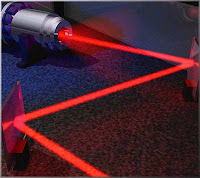 But before long researchers - and soon afterward the rest of the world - agreed that the laser which Maiman created on May 16th 1960 using a ruby rod was an entirely different gimmick. Fifty years later and lasers are everywhere around us: in CD and DVD players, in your doctor's office, maybe even in your shirt pocket. CNN has a great retrospective about a half-century of the laser. And if you want to know how a laser differs from a flashlight, HowStuffWorks hosts a terrific essay about the laser's inner workings.